The Buffalo Bisons, Triple-A affiliate of the Toronto Blue Jays, today announced their initial roster for their 133rd season of professional baseball in Buffalo, NY. Led by first-year Bisons manager, Bobby Meacham, the club will celebrate opening the 30th Season of Bisons Baseball at Coca-Cola Field on Thursday, April 6 facing the Scranton/Wilkes-Barre RailRiders (2:05 p.m.). CLICK HERE to see the Bisons in action on Opening Day! The projected roster his highlighted by three players that rank among the organizations Top 30 prospects: INF Rowdy Tellez (5), RHP Danny Barnes (21) and OF Dwight Smith Jr. (26). Tellez ranks 95th overall in MLB.com's Top 100 list and is tabbed as the 9th-best first base prospect in Minor League Baseball. Tellez, 22, was highly recognized for a strong 2016 season, earning MiLB.com organization All-Star, Baseball America Double-A All-Star, Eastern League mid-season and postseason All-Star awards. He enjoyed his best power season, hitting 23 homers after having totaled just 22 long balls in his first three seasons in pro ball. Additionally with Double-A New Hampshire, he set several career-highs including games (124), hits (130), doubles (29), home runs (23), RBI (81), walks (63), strikeouts (92) and slugging (.530). He also ranked 3rd in the Eastern League with a .917 OPS, T-4th in homers, 6th in RBI, 9th in average (.297) and 10th in doubles. 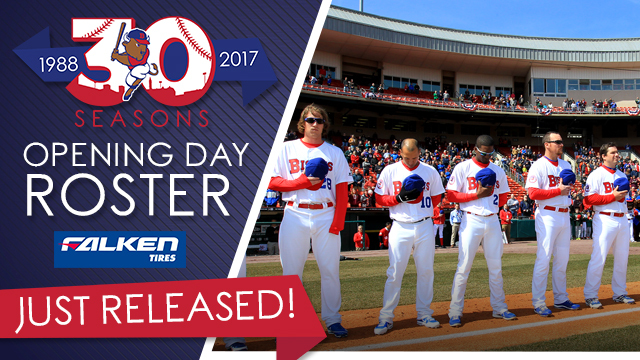 CLICK HERE to download the Bisons' 2017 preliminary roster. Around the diamond, utility-man Jake Elmore appeared in 59 games with the Milwaukee Brewers last season, including 14 starts. Elmore has played with five different Major League clubs (ARZ, HOU, CIN, TB, MIL) since 2012, a season where he represented Reno at the Triple-A All-Star game played at Coca-Cola Field. INF Jason Leblebijian was a mid-season All-Star in the Florida State League last year and combined for a career-high 13 homers (40 XBH) between New Hampshire and Class-A Dunedin last season. INF Christian Lopes played 108 games with New Hampshire and posted a career-high .295 batting average. INF Shane Opitz received two brief calls to Buffalo last year, but spent most of the season with New Hampshire (81G, .217-2-16, 20BB). INF Gregorio Petit played a career-high 89 games with the Angels last season, posting new career bests in virtually every offensive category. The veteran infielder has logged big league time with Oakland, Houston, New York (AL) and Los Angeles of Anaheim. OF Darrell Ceciliani played 82 games with Buffalo last season, leading all Herd hitters (with 100 at-bats) with a .441 slugging pct. He was also third on the club in homers (10), stolen bases (11) and fifth in total bases (143) and was recalled by Toronto three times last season. OF Chris Coghlin was a member of the World Series champion Chicago Cubs this fall and played in nine post season games. Coghlin had a phenomenal rookie season in 2009 with Miami that ended being named the National League Rookie of the Year. Now an MLB veteran of eight years, he spent the majority of the last three seasons with the Cubs, except for a two-month stint in Oakland. OF Ian Parmley and OF Dwight Smith Jr. will make Triple-A debuts this season. Smith, is the son of former Major Leaguer of the same name, ranks 26th on MLB.com Top 30 Blue Jays prospects list. The 24-year old played 126 games in Double-A last year, hitting .265 with a career-high 15 home runs and 74 RBI. The Herd battery will feature a trio of backstops. C Juan Graterol made his MLB debut last September following 11 seasons in the minors. C Alex Monsalve will make his organization debut after spending his entire career in the Cleveland system. C Mike Ohlman will play in the International League for the first time. Ohlman is coming off a 54-game campaign with Triple-A Memphis, where he finished the season hitting .280 with a six homers while hitting .318 at home with the Redbirds. In the rotation, RHP Casey Lawrence is the lone returning Bisons starter. He was arguably the Bisons best starter after the All-Star break last season, allowing three earned runs or fewer in nine consecutive starts and earning the nod as the Herd's Comeback Player of the Year. Lawrence walked just 24 batters in 87.0 innings with the Herd. RHP Jarrett Grube's Triple-A experience is mainly in the Pacific Coast League (Colorado Springs, Tacoma, Salt Lake) before Cleveland signed him in 2015. The righty was extremely impressive that season with Columbus, posting a 9-0 record and a 2.26 ERA in 15 games. LHP Brett Oberholtzer split last season between the Phillies and Angels and was primarily used as a reliever. However, starting is not foreign for the former 2008 Braves draft pick, as 166 of his 218 professional outings have been in that role. LHP T.J. House spent the first eight seasons of his professional career with Cleveland, going 5-3 with a 3.35 ERA in a career-high 18 starts for the Tribe in 2014. RHP Mat Latos has won 14 or more games three times in the big leagues and has 71 career Major League wins. He split last season between the Nationals and White Sox organizations, appearing at the highest level for both squads. The Bisons bullpen features a number of players looking follow up breakout 2016 seasons. RHP Danny Barnes opened last season in New Hampshire, and after pitching to a 1.01 ERA in 35.2 innings, was promoted to the Buffalo in June. With the Herd, he allowed just one run in 17 games (25.2IP) for a 0.35 ERA while throwing more than an inning in nine of his outings. RHP Jeff Beliveau pitched 36 of his career 58 Major League outings with the Rays from 2013-15. He threw 22 games with the Cubs in 2012. RHP Wil Browning made it to Buffalo for one outing last year and in 47 total relief appearances in 2016, pitched to a 3-2 record and a 2.06 ERA with 64 strikeouts and 10 saves. RHP Leonel Campos started last season in El Paso and was called up by the Padres in September. He posted a 2-1 record, 4.32 ERA, and 62 strikeouts in 50 innings with the Chihuahuas. LHP Matt Dermody vaulted through three levels of the Blue Jays' player development last season and capped it all off with a September call up. The lefty specialist made his Triple-A debut with the Bisons and posted a 2.76 ERA in 15 relief appearances. LHP Chad Girodo started his Triple-A career posting a 2.08 ERA over his first 18 games with the Herd and was also summoned to Toronto on three separate times last season. RHP Chris Smith combined to make 47 appearances between New Hampshire and Buffalo last season with a 1.93 ERA, 76 strikeouts and 15 saves in 60.2 innings before having his contract selected by Toronto on September 27.